After an orientation tour of Rapid City, visit CRAZY HORSE MEMORIAL, built in honor of the fearless Sioux Indian chief whose fame is derived from the Battle of the Little Bighorn. Afterward, explore MOUNT RUSHMORE NATIONAL MEMORIAL, which features the monumental likenesses of four U.S. presidents—Washington, Jefferson, Lincoln, and Theodore Roosevelt—carved on the face of a mountain. Maybe stroll along the Presidential Trail for more intimate views or visit the Information Center. This morning enjoy a drive through BLACK HILLS NATIONAL FOREST and experience the area’s colorful history on a guided tour of DEADWOOD, once a wild gold-mining town, and hear the stories of legendary Wild Bill Hickok and Calamity Jane. Afterward, visit TATANKA to learn “The Story of the Bison” and experience the richness of the Lakota people, a Plains Indian buffalo culture. 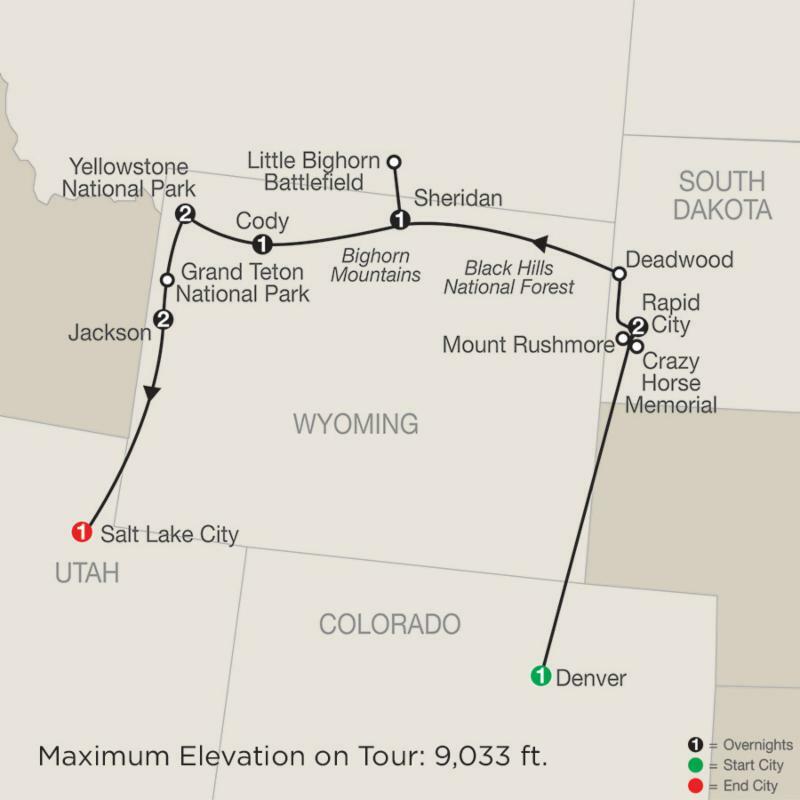 Then, continue through the Black Hills to the cattle town of Sheridan at the foot of the Bighorn Mountains. Price of $3536.00 is per person based on 2 people sharing a room and includes round-trip airfare, round-trip airport transfers, breakfast daily, 4 three-course dinners including a farewell dinner in Salt Lake City, hotel baggage handling and an expert tour director.